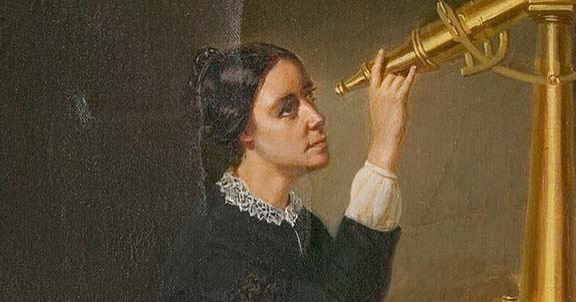 At only twenty-nine, using a two-inch telescope not much better than Galileo’s, she became the first person to discover a telescopic comet, which earned her election into the American Academy of Arts and Sciences the following year. On her certificate of admission, the salutation “Sir” was manually crossed out and “honorary member” was handwritten over the printed “Fellow,” for the Academy had never elected a woman before. The second female member — legendary anthropologist Margaret Mead — wouldn’t be admitted for another ninety years. But most impressive of all — the source from which Mitchell’s pioneering work and lasting legacy sprang — was the steadfast tenacity with which she pursued whatever endeavor she set her mind to, be it scientific observation or education or cultural upheaval. Nowhere is this more evident than in a mundane yet monumental incident with which Mitchell’s 1855 began: The fine wires, known as spider’s web, making up the grid on one of the micrometer onto which she was projecting celestial motions broke and she set out to repair it; her initial instinct was to use a piece of actual spider’s web to replace the broken micro-wires, but when that proved unworkable, she decided to use hair from her own head, taking care to pull out a white one since she had “no black ones to spare.” She was thirty-six. I put some wires into my little transit this morning. I dreaded it so much, when I found yesterday that it must be done, that it disturbed my sleep. It was much easier than I expected. I took out the little collimating screws first, then I drew out the tube, and in that I found a brass plate screwed on the diaphragm which contained the lines. I was at first a little puzzled to know which screws held this diaphragm in its place, and, as I was very anxious not to unscrew the wrong ones, I took time to consider and found I need turn only two. Then out slipped the little plate with its three wires where five should have been, two having been broken. As I did not know how to manage a spider’s web, I took the hairs from my own head, taking care to pick out white ones because I have no black ones to spare. I put in the two, after first stretching them over pasteboard, by sticking them with sealing-wax dissolved in alcohol into the little grooved lines which I found. When I had, with great labor, adjusted these, as I thought, firmly, I perceived that some of the wax was on the hairs and would make them yet coarser, and they were already too coarse; so I washed my little camel’s-hair brush which I had been using, and began to wash them with clear alcohol. Almost at once I washed out another wire and soon another and another. I went to work patiently and put in the five perpendicular ones besides the horizontal one, which, like the others, had frizzled up and appeared to melt away. With another hour’s labor I got in the five, when a rude motion raised them all again and I began over. Just at one o’clock I had got them all in again. I attempted then to put the diaphragm back into its place. The sealing-wax was not dry, and with a little jar I sent the wires all agog. This time they did not come out of the little grooved lines into which they were put, and I hastened to take out the brass plate and set them in parallel lines. I gave up then for the day, but, as they looked well and were certainly in firmly, I did not consider that I had made an entire failure. I thought it nice ladylike work to manage such slight threads and turn such delicate screws; but fine as are the hairs of one’s head, I shall seek something finer, for I can see how clumsy they will appear when I get on the eyepiece and magnify their imperfections. They look parallel now to the eye, but with a magnifying power a very little crook will seem a billowy wave, and a faint star will hide itself in one of the yawning abysses. Finding the hairs which I had put into my instrument not only too coarse, but variable and disposed to curl themselves up at a change of weather, I wrote to [Harvard College Observatory director] George Bond to ask him how I should procure spider lines. He replied that the web from cocoons should be used, and that I should find it difficult at this time of year to get at them. I remembered at once that I had seen two in the library room of the Atheneum, which I had carefully refrained from disturbing. I found them perfect, and unrolled them… Fearing that I might not succeed in managing them, I procured some hairs from C.’s head. C. [Mitchell’s nephew Charlie] being not quite a year old, his hair is remarkably fine and sufficiently long… I made the perpendicular wires of the spider’s webs, breaking them and doing the work over again a great many times… I at length got all in, crossing the five perpendicular ones with a horizontal one from C.’s spinning-wheel… After twenty-four hours’ exposure to the weather, I looked at them. The spider-webs had not changed, they were plainly used to a chill and made to endure changes of temperature; but C.’s hair, which had never felt a cold greater than that of the nursery, nor a change more decided than from his mother’s arms to his father’s, had knotted up into a decided curl! — N.B. C. may expect ringlets. Complement with trailblazing astronomer Vera Rubin, who discovered dark matter, on how Mitchell inspired her, then revisit Rachel Ignotofsky’s illustrated celebration of pioneering women in science and Lia Halloran’s stunning cyanotype tribute to female astronomers.